This past Labor Day weekend I traveled to Colorado Springs to see my daughter Kelly, her husband Chanse and my grandkids Kylie and Casen. A quick trip indeed riding my latest bike, a ’06 Ultra Classic. Leaving Saturday after work puts me in Colorado Springs around 8:30 pm mountain time and can make for a long day. But as riding to Colorado goes, longer is better, right? After a short visit on Saturday night I was eager to get some rest as Chanse had planned a ride to the top of Pike’s Peak Sunday morning before the rest of the house woke up. Pike’s Peak? I’m in. I will tell you from a Kansas boy’s perspective that a little bit of altitude can make me feel a lot light-headed. The highest point around where I live is Blythe’s hill. The first day of visiting with the kids is always an adjustment, but after that I’m good. Unless you’re expecting me to run, walk or climb a bunch of stairs. We head out on our bikes for the 20 minute ride there, and of course, the excitement is building. You can’t help but look at the front range as you’re rolling through town and again for a Kansas boy, well, I think you know. We stop for gas just before the entrance and I have to admit I wasn’t sure what to expect. Temperature was in the high 50’s so after gassing up I put my gloves on. I already had my leather jacket on so let’s do this! After Chanse paid the way into the park he let me lead. It’s still pretty early in the morning and the shadows were making cornering difficult. Those decreasing radius corners wreak havoc on a guy riding a big bike on an unfamiliar road. I know they race up this mountain every year for the Pike’s Peak International Hill Climb and right now I’m in last place. 19 miles and counting. We soon fall into a rhythm and I start to relax. That’s the key to this – relax. With very little traffic I feel we’re making decent time and I will say the view is spectacular. As we approach the tree line where the terrain begins to change to moon-like, things become different. The temperature is dropping, the air is thinning like the hair on my head and the road is becoming more difficult. Speed isn’t a real factor, but momentum is. Slow is good as long as you’re not going too slow. At this point it’s obvious I’m not dressed warm enough and the sign I just passed indicated I still had a few miles to go. Up that is. It’s becoming windy and I later find out the gusts are up to 50 mph. Like a punch to my face, the wind hits me every so often and I can’t breathe. I look in my mirrors to see if Chanse is still back there in hopes that I would have to turn around and go back looking for him. Chanse is still there, and I think he let me lead so he wouldn’t have to go back for me. The last 2 miles were difficult for me. Old and out of shape doesn’t help and neither does a lack of oxygen. We get to the top and park the bikes, climb off and look around. Fun Fact – it took us about 45 minutes to reach the top and the winner of this year’s Pike’s Peak Hill Climb was one of only three people to do it in less than 10 minutes. To the winner, speed is a factor. To me? Oxygen. We are both freezing as the wind chill is hovering at 30 degrees or so and we seek shelter in the gift shop. Closed. It doesn’t open for another 10 minutes and shelter from the wind is found on the side of the building. Finally the doors open in what seemed to be an hour later and we find the restroom to warm our hands under the hand dryers. I ask Chanse why people are wandering around here with shorts and light jackets on and he tells me they hiked up Pike’s Peak. On foot? “Yes” he says. I asked him what day would you have to leave to get here before us and he tells me at day break. I’m winded and I rode up the mountain. They hiked and look great! I could hear the voices in my head saying we will have to go back outside and ride back down even though my body was telling me to have a seat and stay awhile. At 14,110 feet they really need to pump oxygen into the gift shop. My head is now pounding and Chanse has his butter pecan fudge he bought for Kelly and we are ready to go. We start to take a picture by the sign at the summit for proof of this adventure and a gentleman walks over and volunteers to take it for us. Chanse reciprocates for him and as far as I’m concerned we can’t get down to 5000 feet soon enough. Oh, and as I said the view is spectacular. Chanse leads the way and immediately I feel better. Slow and sure we work our way down as the traffic is coming up. A real advantage of getting there early. I’m finally able to look around and take it all in. This is really a great experience and it’s something everyone should do at least once in their lifetime. Coincidently, there were only a couple of times I thought I was going to die. I didn’t of course, but what makes a story more interesting than having a close call? This was a great ride to share with my son-in-law Chanse. Epic for sure and I would do it all over again. Thanks Chanse, for a great day! 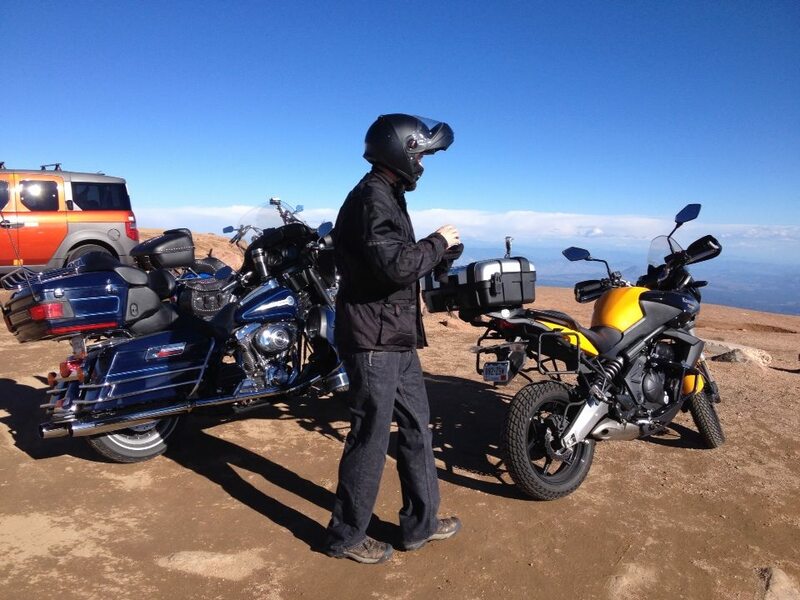 It’s only thanks to motorcycles that I miss Colorado at all. That’s something close to paradise, even though I got a speeding ticket every year I lived there. Tried to comment earlier but it didn’t work. I think that’s my apps fault? 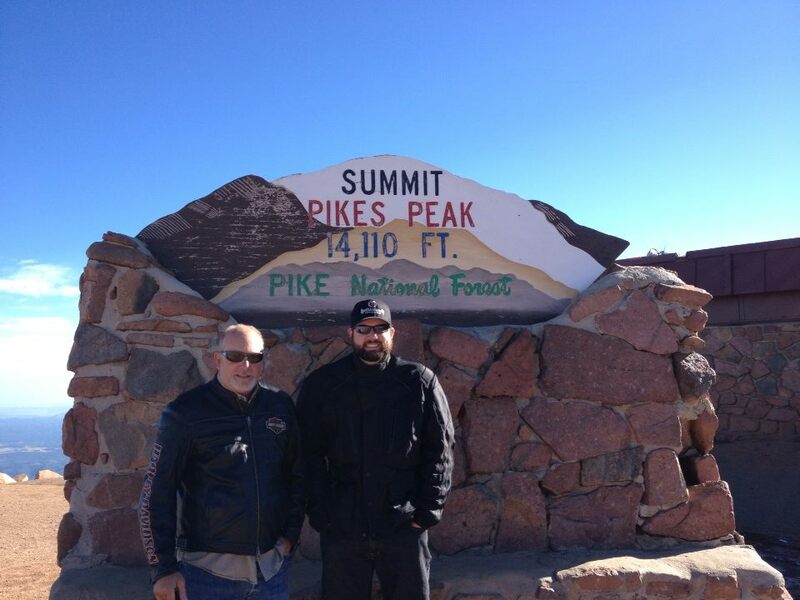 Anyway, pike’s peak was already on my hit list for motorcycle ride destinations. Great that you got to hit it up on two wheels with a ‘local’ to ride along with ya!